Welcome to our ultimate guide for collecting every Power Moon from the Snow Kingdom in Super Mario Odyssey! Below, you'll find maps detailing the exact location for all 55 of the Power Moons located in this Kingdom, as well as descriptions on how to get each and every one of them. 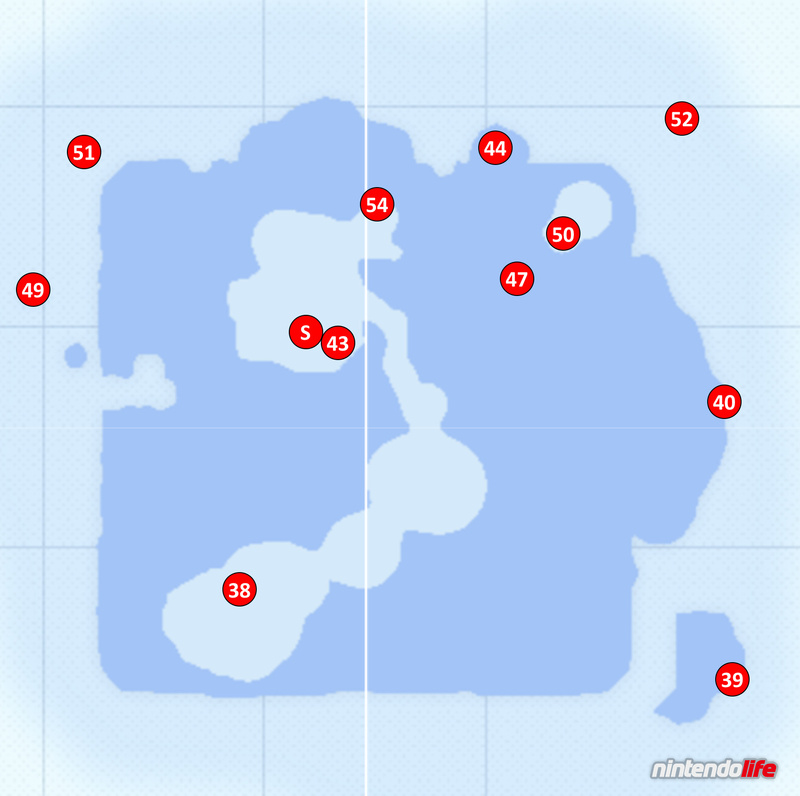 The numbers on the maps correspond to the relevant Power Moon listed below and, whilst most of them appear in that spot from the beginning (or after you've completed the story at least), it is worth nothing that sometimes you are required to perform a specific action to make it appear. Use a combination of our maps and walkthrough information to grab each of the Power Moons with ease. Enjoy! Several Power Moons in the Snow Kingdom are located in the underground 'Shiveria Town'. As this town does not have a map in the game, any Moons from this location are indicated by [S] below. You can find the entrance to Shiveria Town at location 'S' on our map above. [S] 1. The Icicle Barrier: At the bottom of Shiveria Town, enter the first tunnel on the right. Make your way to the end of this room and walk over the three 'X's surrounding the ice patch to make it drop to the ground below. Drop down and collect the Power Moon waiting for you. [S] 2. The Ice Wall Barrier: Enter the second tunnel on the right at the bottom of Shiveria Town. You'll need to collect the five Moon Shards hovering over the ground from this room to be rewarded with a Power Moon. [S] 3. The Gusty Barrier: Enter the first tunnel on the left at the bottom of Shiveria Town. Make your way through the room until you reach the last gap before the green pipe exit. Capture the Ty-Foo to fly across and collect your Power Moon. [S] 4. The Snowy Mountain Barrier: At the bottom of Shiveria Town, enter the second tunnel on the left and defeat Rango to collect this Power Moon. [S] 5. The Bound Bowl Grand Prix: After you've cleared all four tunnels at the bottom of Shiveria Town, you'll be able to participate in the grand prix. Head down the slope to the race and then over to the nearby room to find a Shiverian who doesn't want to move. Capture him with Cappy and return to start the race. You'll need to win to get the Power Moon. [S] 6. Entrance to Shiveria: When you first drop down into the Shiveria Town entrance, turn around to find a tall stack of cardboard boxes leading up to a Power Moon. Use wall jumps between the boxes and the wall to get yourself up to the Moon. [S] 7. Behind Snowy Mountain: In the Shiveria Town tunnel where you fought Rango (second one on the left), keep an eye out for a wooden posts sticking out of the ground. You'll notice that behind one of these wooden posts, on the left hand side, is a slightly discoloured patch of wall. Walk through this patch to reveal a hidden tunnel leading to a Power Moon. [S] 8. Shining in the Snow in Town: At the bottom of Shiveria Town, climb the pole located just to the right of the right hand side tunnels. Run around to the left and jump across the wooden light beams to the other side. Now smash your way through the giant snow pile to uncover a Power Moon. [S] 9. Atop a Blustery Arch: In the first tunnel on the left at the bottom of Shiveria Town, make your way to the area where two Ty-Foos are pushing a block between them. Capture the second one of these Ty-Foos and use it to blow the staircase behind him away from you. Now continue through the room until you come across the next Ty-Foo (who won't be trapped by fencing) and blow the stairs back to their original position. You should now be able to climb the stairs up to a wooden archway which has a small 'X' scratched into it. Ground pound this spot for a Power Moon. 10. Caught Hopping in the Snow! : South of the Odyssey, around location number 10 on our map, you should be able to find a rabbit hopping around. 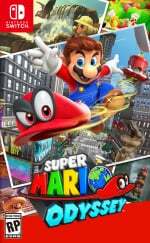 Chase the rabbit, using Cappy to stun it if necessary to catch it and claim your Power Moon. [S] 11. The Shiverian Treasure Chest: Complete all the steps for Power Moon number 8 above, and then continue smashing your way through the snow on this side of the second floor. Enter the hallway that is revealed from behind this snow and follow it around to the left. You'll come across a treasure chest containing a Power Moon. [S] 12. Treasure in the Ice Wall: Enter the second tunnel on the right at the bottom of Shiveria Town to find the room with the Bitefrosts who pop up out of the ground. Make your way to the final Bitefrost (just to the right of where the green pipe exit is) and ride it up until it reaches full extension. Jump up out of the way of its bite and grip onto a thin ledge in the wall. Shimmy over to the right to find a treasure chest containing a Power Moon. 13. Snow Kingdom Timer Challenge 1: Head to location 13 on our map to find a scarecrow. Throw Cappy at the scarecrow and make your way over the circular ice platforms in front of you to get the Power Moon. 14. Snow Kingdom Timer Challenge 2: At location 14 on our map (underneath the archway on the ground below) you'll find a scarecrow. Throw Cappy at the scarecrow and make your way across the beams that appear to reach the Power Moon. If you're struggling for time, make sure to shake your controller(s) as you climb the poles to move quicker. 15. Moon Shards in the Snow: For this Power Moon, you'll need to find five Moon Shards dotted around the Kingdom. All of the shards are located above the ground; none are below in Shiveria Town. Look around on the platforms in the main area, on the snow banks that surround the outer edges, and even underwater to find them all. 16. Taking Notes: Snow Path Dash: Head to location 16 on our map to find a glowing treble clef. Touch it, and then collect all of the music notes that appear in various directions, to get the Power Moon. 17. Fishing in the Glacier! 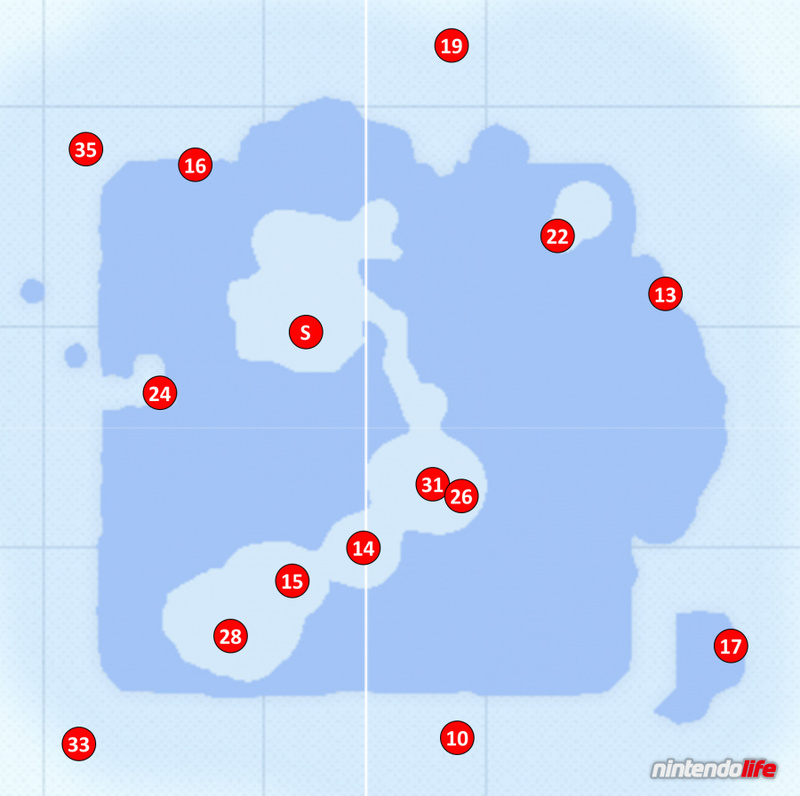 : Head to the glacier in the southeast corner of the map and capture the Lakitu who is fishing there. Use his rod to lure in the largest underwater shadow to find a Cheep Cheep who will give you a Power Moon. [S] 18. Ice-Dodging Goomba Stack: In the first tunnel on the right at the bottom of Shiveria town, you'll notice a Goomba-shaped button with a large number 4 on it. Capture a Goomba, and then jump on other Goombas to create a stack of four, before walking to the shadow in front of the button. Move out of the way again quickly to allow the icicle to fall from the ceiling, allowing you to jump up to the button as the four Goombas. Stand on it to reveal the Power Moon. 19. Captain Toad is Chilly! : On the north shore, quite a way up the hill around location 19 on our map, you'll come across a small cave that has been covered in a layer of snow. Smash your way through the snow to find Captain Toad inside. Talk to him to receive a Power Moon. [S] 20. I’m Not Cold! : Opposite the Crazy Cap store in Shiveria Town, you'll find a Shiverian who explains that their racing uniform is their 'undies'. You'll need to wear the Boxer Shorts (available from the Crazy Cap store for 1,000 gold coins) and talk to him again to recieve a Power Moon. [S] 21. Shopping in Shiveria: You can purchase this Moon from the Crazy Cap store in Shiveria Town for 100 gold coins. 22. Walking on Ice! : Head through the red hat door right next to the Corner of the Freezing Sea checkpoint flag. Inside you'll face a triangular walking challenge. Be very careful here with how quickly you walk - the ice will make you slide behind where you would naturally stop. If you get enough points, you'll be rewarded with a Power Moon. [S] 23. Snowline Circuit Class S: Head back to the race track in Shiveria Town (as the Shiverian that you captured last time) to have another go at the race and collect a second Power Moon. To win, you'll need to make effective use of bounding, pressing 'B' every time you make contact with the floor and using the slanted parts of the track to bounce across the screen in the direction of the track to cut corners. 24. Dashing Over Cold Water! : Head to location 24 on our map and clear the pile of snow to reveal a red hat door. Enter this room and use the Rocket Flowers to make your way to the end to find a Power Moon. 25. Dashing Above and Beyond! (see location 24): In the same area as Power Moon 24, keep collecting Rocket Flowers and pass the area where you can see the room's main Power Moon, jumping up onto the slope behind it. Climb this slope and dodge the barriers in the way to make it to an area with a second Power Moon. 26. Jump ‘n’ Swim in the Freezing Water: Follow the path northeast of the Odyssey and jump off the edge near location 26 on our map. Turn around to find a blue door next to a scarecrow. Throw Cappy at the scarecrow to enter, and then make your way through the room inside - using the columns of water to move around - to find a Power Moon. 27. Freezing Water Near the Ceiling (see location 26): In the same room as Power Moon 26, make your way to the end of the room where a wide column of water takes you to the exit. Instead of going down to the exit here, jump on top of it and swing across the poles to find a second Power Moon. 28. Blowing and Sliding: For this Power Moon, you'll first need to capture one of the Ty-Foos near the entrance to Shiveria Town and take it to the south side of the column where the Odyssey is sitting above. With the Ty-Foo, blow the wooden block across to reveal a door (if your Ty-Foo isn't at the right height to do this, go back and grab another one). Inside, use the Ty-Foo to complete to puzzle, blowing the blocks around to get them into place, to receive a Power Moon. [S] 29. Moon Shards in the Cold Room: Make sure you're wearing the Snow Hood and Snow Suit (available from this Kingdom's Crazy Cap store) and then head to the pole just to the right of the right hand side tunnels at the bottom of Shiveria Town. Climb the pole and talk to the Shiverian to gain access to a locked door - collect five Moon Shards within the 2D area to receive a Power Moon. [S] 30. Slip Behind the Ice: In the same location as Power Moon 29, make your way through the 2D section until you reach the platform above the green pipe exit. Jump up here to reveal some hidden blocks that allow you to access the area above in the ceiling. Run to the left (you don't need to jump over the tiny gaps) and collect the Power Moon at the end. 31. Spinning Above the Clouds: Near the entrance to Shiveria Town, you should find a seed frozen in a small block of ice. Smash the ice and grab the seed - you'll need to take it to location 31 on our map (heading back towards the Odyssey). At that location you'll find a plant pot - throw the seed in and climb the beanstalk that appears to access a new area. Use the wind and trampolines to make it to the end of the room to grab a Power Moon. 32. High-Altitude Spinning (see location 31): In the same area as Power Moon 31 you should find that, by riding one of the wind updrafts to the very top, you can turn around and land on a trampoline that takes you back the way you came. Land on this trampoline and travel backwards to find a Power Moon floating really high in the air. 33. Secret Path to Shiveria! : Depending on your choices in the game, the warp painting needed to travel to the Snow Kingdom for this Power Moon will either be located in Bowser's Kingdom or the Mushroom Kingdom. In Bowser's Kingdom, head to the Main Courtyard Entrance checkpoint flag and run around to the back of a building on the left. If the painting here depicts the Snow Kingdom, jump inside to be warped to this Power Moon. If a different Kingdom is shown instead, head to the Mushroom Kingdom and run south from the Odyssey to find a painting in the middle of a group of trees. This should take you to the Snow Kingdom if the previous painting lead elsewhere. [S] 34. Found with Snow Kingdom Art: As soon as you enter Shiveria Town, turn to the left to find some hint art on the wall. Use this hint art to find the same location in the Lost Kingdom. When you've arrived at the Lost Kingdom, warp to the Mountainside Platform checkpoint. Head north from here and then turn east, jumping over to the roots of the tree that are depicted in the hint art. Ground pound on the correct root to receive a Power Moon. 35. Snow Kingdom Regular Cup: Head to location 35 on our map in the northwest to find a Koopa who will challenge you to a race. The hardest part of this race is learning the route you need to take as the blizzard obscures your view. Take a couple of run-throughs to learn the routes that the Koopas take and where the goal is, before returning with your new-found knowledge to win and receive the Power Moon. [S] 36. Hat-and-Seek in the Snow: Head to the area of Shiveria Town where the races take place and find the Shiverian who is wearing a hat with eyes just like Cappy (on the left side of the room if you're facing the podium). Talk to the hat to receive a Power Moon. [S] 37. Peach in the Snow Kingdom: Inside Shiveria Town, from the entrance, walk down the pathway and look to the left to find Shiverians sitting on steps. Princess Peach will be here too - talk to her to receive a Power Moon. These Power Moons will become available to you when you have smashed the Moon Rock located in this Kingdom. As before, any Moons located in Shiveria Town are indicated by [S] below. You can find the entrance to Shiveria Town at location 'S' on our map. 38. Shining on High: Climb onto the top of the Odyssey and perform a long jump to reach a Power Moon floating nearby. 39. Above the Freezing Fishing Pond: Head southeast from the Odyssey and you'll see a Power Moon floating above the fishing pond. 40. Ice Floe Swimming: Head to location 40 on our map and dive underwater. You'll find a small underwater alcove containing some coins and a Power Moon. [S] 41. Icy Jump Challenge: In the first tunnel on the left at the bottom of Shiveria Town, make your way to the area where two Ty-Foos are pushing a block between them. Jump on top of this block and perform a backflip at the right moment to get the Power Moon floating above you. [S] 42. Forgotten in the Holding Room: Head to the bottom of Shiveria Town and jump into the hole at the end to reach the racecourse. Enter the room on the left hand side of this area, jump up the stairs inside, and turn left to find a room full of boxes stacked into tall piles. One of these boxes (near the top of one of the piles) will be glowing - smash the boxes to make this one fall down and smash it to reveal a Power Moon. 43. It Popped Out of the Ice: Warp to the Above the Ice Well checkpoint flag and climb the tall ice structure that has regular ledges. Jump from the top of this structure to the other one nearby in an easterly direction. You'll find a glowing spot on this structure which contains a Power Moon - ground pound the spot to make it appear. 44. Deep in the Cold, Cold Water: Head to location 44 on our map and dive underwater. You should notice a glowing spot on the floor below the water - ground pound this spot to reveal a Power Moon. [S] 45. Water Pooling in the Crevasse: Enter the second tunnel on the right hand side at the bottom of Shiveria Town. At the far end of this area (near where there are lots of gold coins in a square-like shape) you'll see a glowing patch underwater. Jump into the water and ground pound this spot to reveal a Power Moon. [S] 46. Squirming Under Ice: Enter the second tunnel on the left hand side at the bottom of Shiveria Town. Make your way right to the end of this area until you reach the place where you fought Rango. You'll see a bump moving around in the ground - hit it with Cappy and then perform a ground pound on it to reveal a Power Moon. 47. Snow Kingdom Timer Challenge 3: Head to location 47 on our map to find a P-Switch underwater. You'll need to hit this P-Switch and make your way over to the Power Moon that appears before the timer runs out. You can either do this as Mario by constantly jumping through the water and performing a long jump at the end to touch the Moon before it disappears, or by capturing a Cheep Cheep before you press the switch and swimming over (making sure to jump over the snow that is in the way). [S] 48. Stacked-Up Ice Climb: Enter the first tunnel on the right hand side at the bottom of Shiveria Town. Inside, make sure to capture the first Goomba you see and keep jumping on other Goombas to build a high tower. Make your way to the end of the level, collecting all of the Goombas, until you see a new Goomba-shaped button with a number 10 written on it. If you have 10 Goombas, stand on it to reveal a Power Moon; if you don't, just jump back down to collect more as they re-spawn. 49. I Met a Snow Cheep Cheep! : At location 49 on our map you'll find a Bonneter who wants to see a Cheep Cheep up close. Head into the water to find a Cheep Cheep and take it over to this area, hopping all the way up as quickly as you can to get the Cheep Cheep inside the small pool of water right next to the Bonneter. If you do this, you'll be rewarded with a Power Moon. 50. Even More Walking on Ice! : At location number 50 on our map and re-enter the door here to start a second walking challenge. The pattern is exactly the same as before, but this time you'll need to score 90 points to get the Power Moon. As before, make sure to keep an eye on how Mario slides on the ice - you don't want to accidentally overshoot as he slips. 51. Snow Kingdom Master Cup: Head to location 51 on our map to talk to the Koopa who will challenge you to a second race for a second Power Moon. The key to winning this race is to take the exact same route as the golden Koopa - you just need to do it quicker! Capture a Cheep Cheep as early as possible until you reach the land, pop out the wooden peg and ride the updraft, then keep long-jumping across the platform above to fly past the Ty-Foo before he manages to blow you off the edge - the Koopa will wait for the Ty-Foo to blow before running past so this is your chance. 52. Iceburn Circuit Class A: Head to where the Moon Rock originally was (near the Corner of the Freezing Sea checkpoint flag) to find a door that will take you to a second racetrack. Capture the Shiverian and win the race to claim your Power Moon. The best advice for these races is to make sure you bound each time you make contact with the floor or walls (and at the right time with the right amount of strength). This will come with practice and you'll start to learn the layout of the circuit too - you'll need to bounce off the walls at just the right time and place to ping yourself across the screen to make the most out of every corner. 53. Iceburn Circuit Class S (see location 52): In the same area as Power Moon 52, simply talk to the organiser of the race again after winning the A Class race to enter into a second S Class race. You'll need to be even quicker this time to get the win and the Power Moon but the same advice applies. 54. Running the Flower Road: Head to location 54 on our map (near the Above the Ice Well checkpoint) to find a grey warp pipe. Enter the pipe and throw Cappy at each of the scarecrows to reveal flower paths - make your way to the end of the room to collect a Power Moon. 55. Looking Back on the Flower Road (see location 54): In the same area as Power Moon 54, make your way through the room until you reach the Banzai Bill section. Here, you'll need to hop back over to the left flower road path after you pass the second Banzai Bill. If you turn around you should see a Power Moon waiting for you there. We hope that you have found this guide on collecting all Power Moons in Super Mario Odyssey's Snow Kingdom useful. Let us know if you've managed to grab them all with a comment below. Iceburn Class S is a real pain. I've read a bunch of tips (which all basically come down to "don't Bound on inclines") but I haven't been able to get the knack of it yet, it seems like I either almost win or come way in last arbitrarily. It's one of like five moons I have yet to get. Anybody have any better advice? 2: try out things (like not bouncing all the time) and look at your lap times, figure out why some of your lap times were faster than others. 3: bounce over pieces of snow (in bends), try to take the inside of the bend, try to position your bounces. @essiw Yeah, it seems like everyone's advice is basically to keep trying it until you randomly win. I'm halfway decent at Mario Kart and whatnot, I know to take the inside corners and stuff, it just seems like there's got to be a better strategy to this than just "try not Bounding sometimes and Bounding other times" but nobody seems to have a clear handle on it (yet). @DanElectrode well, it is not random, it is just that it is difficult to explain as when to Bound or not to Bound depends on the situation. You might be better of watching videos for tips. @essiw I understand this, I wasn't trying to be disrespectful to you or anyone here, I just read quite a few different guides trying to get a handle on it and they all basically said "try different combinations of Bounding and not Bounding" which is not particularly helpful. @essiw Finally got it! Alternating Bounding and rolling on straightaways seemed to work pretty well. That was my last moon, now I've got 'em all!